Why should you buy a night vision monocular? Well, seeing what’s going on at night can be very useful for certain hobbies whether you’re hunting nocturnal wildlife or on a camping trip. In fact, having the best night vision monocular may keep you safe since you can see beyond what is offered by a typical flashlight and spot any potential dangers. Once you’ve tried a night vision monocular, you’ll wonder how you ever managed without it! Choosing a night vision monocular can be tricky business as it’s difficult to know what to look for. That’s why we’ve provided a list of night vision monocular reviews as well as a buying guide. With all of this information, you’ll quickly and easily be able to narrow down the options. We hope that this results in you finding a great night vision monocular to suit not only your needs but also your budget! The fact that you can use the Gemtune WG-50 not only as a monocular but also as a camera and video make it a very impressive option. The digital night vision monocular offers an observation distance of 350 meters in a fully dark environment. Up to 6x optical magnification should be more than enough for most people’s needs whether hunting or simply observing distant goings on from your campsite. This product has a built-in 1.5-inch LCD screen as well as HD 720P video recording so that you can share what you see with family and friends. With a 50mm lens, this monocular has good light gathering which is one of the reasons why it offers excellent optical quality. Also included with the Gemtune WG-50 are a protection bag, USB cable, TV cable and a lens cloth. One area in which this product could be improved is in the battery life which is a little short for our liking. 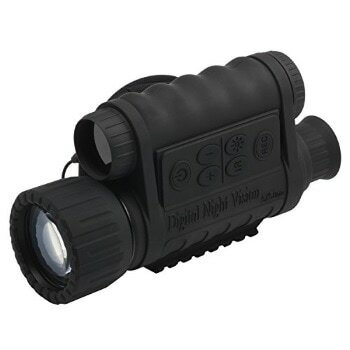 However, we like the versatility offered by this night vision monocular since it can be used day or night. It has a fairly durable construction but is not waterproof. Overall, we’re very impressed by what the Gemtune WG-50 has to offer and for us, it’s the best night vision monocular on the market as of now. Such are the qualities of the Xikezan 16GB, it came a very close runner-up to the Gemtune WG-50 (our top pick). With a 720p HD camera and camcorder, you can have photos and videos of what you’re observing whether it’s day or night. There’s a degree of flexibility offered by this monocular since the magnification is 6x while there’s also a digital zoom of 1-5x. You can expect to see up to 350 meters in the dark with this night vision monocular. We particularly like the built-in color LCD screen which makes navigation and mode selection very quick and convenient. While not waterproof, the housing of this unit is fairly rugged and is water resistant. No batteries are included with the unit but it does come with a soft cleaning cloth, USB cable, TV cable and protection bag. While no tripod is included with this product, it is tripod mountable if you’re seeking additional stability. In our opinion, the warranty of this product is not the best since it’s only a 12-month manufacturer warranty. This is something to consider if you’re planning on spending a few hundred dollars on a night vision monocular such as this. Otherwise, it’s a very good option to consider. If you can see past the somewhat ugly and unconventional design of the Solomark night vision monocular, you’ll find a great value product that we feel is the best night vision monocular for the money. It provides you with the ability to see up to 100 meters in the dark. While this is not as powerful as more expensive products on the market, you may find that it’s enough for your needs. Despite the very competitive price, we’re impressed by the features on this particular product which include multi-coated glass objectives and in-built color LCD screen. 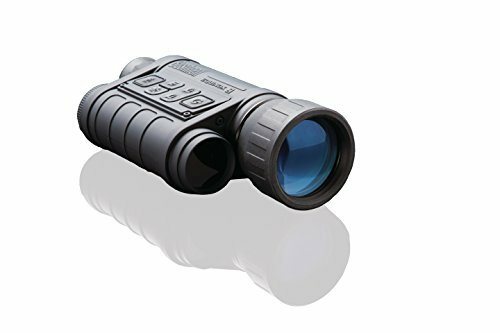 With this night vision monocular, you can record video and take photos and easily transfer them to your computer or even your television. With this product, you can also expect to receive a 16GB micro SD card, a mini USB cable, AV cable, neck strap and carry case. It does require batteries but these are not included, as is often the case with night vision products. While you may be unsure about a budget option such as this, it does at least come with a 2-year limited warranty. 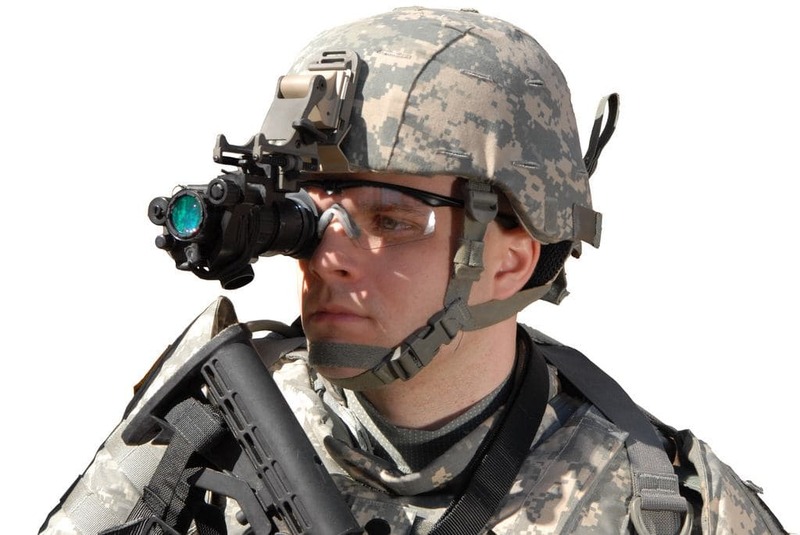 This really is a more entry level night vision option with optics to reflect this. But you may be surprised by the quality that it offers for the price. For a night vision monocular that offers solid day and night viewing, the Bushnell Equinox Z ticks both boxes. With the 30mm objective lens, 3x magnification and 1-3x digital zoom, you can see up to 200 meters which is about average for a night vision monocular. We are impressed with the optics of this product which are in part down to the multi-coated glass objectives. As with many night vision monoculars now on the market, you have the option to capture images and record videos of nocturnal wildlife and the like. We like that the shutter speed is very fast so even slight movement won’t blur your photos. This is a product that has a fairly rugged build and while not waterproof, it does have water-resistant housing. It weighs 2lbs so is relatively portable though there are lighter weight products on the market. While you can run this product off batteries, it can also be charged via the mini USB port which we think is a very handy feature. The Bushnell Equinox Z does come with a few accessories. One of these is a carry bag which we felt was a bit too much of a tight fit. In our opinion, this is a solid mid-priced night vision monocular with few real faults. At 4.13 x 8.19 x 2.44 inches, the Bestguarder 6X50mm HD is not the most portable of night vision monoculars. However, it does offer some impressive features that shouldn’t be overlooked. First off, it offers up to 6x magnification which is more than many rival products on the market. A 1-5x digital zoom and 50mm objective lens ensures that you’ve got plenty of flexibility during use. In fact, there’s up to 350 metres of viewing distance on offer which is more than enough for anybody who is camping or hunting. You can also use this night vision monocular during the day. The ability to take photos and record videos and store them on the micro SD card is very convenient and we’re generally impressed with the quality produced. The unit itself is fairly rugged and the rubber coated housing is water-resistant which means that it can be used in the rain, for example. With two tripod jacks (one on the bottom and one on the side) it’s tripod mountable which is useful for times when you’re keen to maximise your comfort while minimising image shake. One thing we don’t like about the Bestguarder 6x50mm HD is that it runs through AA batteries far too quickly so keep this in mind if you’re out and about for long periods of time with this product. Since most people have never used night vision before, it’s good to take the time to understand how it works, which features are most important and how to get the best use out of it. Our buying guide provides you with all of the necessary information to make an informed decision, saving you time and effort. Since you’re planning on using night vision, it can’t hurt to know how it works! Not all light is actually visible. For example, infrared light and ultraviolet light cannot be seen by the naked eye. By collecting all of the available light (including the infrared light) and then amplifying it, we’re then able to observe the image with ease. This type of night vision is called image enhancement. There is another type that goes by the name of thermal imaging. Generation I: The most common type on the market, Generation I is also the most affordable. For this reason, they’re very easy to use and are best suited to hobbyists. Generation II: Often used by security and law enforcement, Generation II devices are also relatively common on the market. They offer a slightly clearer and brighter image than Generation I and, for this reason, are more expensive. Generation III: Another step up in quality, Generation III units are ideal for when little to no light is available (whether artificial or natural). Again, you can expect these to be more expensive as a result. Generation IV: The best you can buy, Generation IV are very expensive. However, they offer top quality performance even in the lowest light conditions. While our reviews and buying guide is primarily about monoculars, you may be interested to know that you can have night vision via a few other devices. Which you choose will depend on what you’re using the night vision for. A very popular night vision option, binoculars allow you to magnify images. They’re a particularly good option for nature enthusiasts though they obviously require both hands. The versatility monoculars provide make them another popular choice when it comes to night vision. Like binoculars, they allow image magnification. However, they only require one free hand. Unlike with binoculars and monoculars, goggles allow the user the use of both hands. They’re easy and comfortable to use but magnification is not available on all models. Hunters appreciate night vision scopes as they are typically attached to rifles. They feature magnification for quicker and easier sighting of targets in the dark. You probably already have a specific use in mind for your night vision monocular. But it’s always a good idea to consider the multiple uses in order to make the best choice. For example, you may want your night vision monocular for night-time hiking but did you know that you could also use it for night-time fishing or camping? While many modern night vision monoculars are designed with durable housing, they can still be damaged by even the odd bump or scrape. While rubberized exteriors and water-resistance are helpful, these aren’t always enough to prevent damage. As such, take great care of your monocular and be sure to get one with a great warranty! Being able to see in the dark is amazing. But just because you can see what’s in front of you in the dark, doesn’t mean you shouldn’t be paying attention to what’s going on around you. Situational awareness is important and this includes paying attention to sound. This can help you avoid any potential hazards. The most important thing to consider when choosing a night vision monocular is the optical quality that a particular product offers. Most of the products you find on the market will be Generation I. This means that they’re on the lower end of the spectrum in terms of optical quality. But this doesn’t have to mean that they don’t offer good quality images. Most night vision monoculars offer 3x or 6x magnification which is more than enough for the needs of most people. In reality, using the higher magnification isn’t always useful since the image quality can be greatly reduced. Linked to magnification is the observation distance which is measured in feet or meters. This tells you the maximum distance you’ll be able to see with your monocular. This could be anything from 100 to 350 meters. As you’ll have seen from the products we’ve reviewed above, most offer you the chance to take photos and record videos of what you’re seeing through your night vision monocular. Some of these offer HD quality and the option of saving these images and recordings to a micro SD card. You can then upload these to your laptop or even your television to share with friends and family. Depending on what you plan to use your night vision monocular for, the size and weight of the product may or may not be important. If you’re on long night-time hikes then you’ll want something that is nice and portable. These products can vary a great deal in size and weight. You can expect most to weigh somewhere between 1 and 2 lbs. Smaller and lighter products tend to be more expensive but this isn’t always the case. The majority of night vision monoculars accept AA batteries which is convenient. However, the level of convenience is really down to the battery life which, in some cases, can be on the short side. Be sure to check consumer reviews online to see what’s being said about the battery life of the product that you’re interested in. In some cases, it is possible to charge a night vision monocular via a mini USB port. This can save a lot of money on batteries! Night vision monoculars don’t come cheap (though there are some great value products to be found!). As such, we highly recommend that you find a product that offers a good warranty. This should be at least a couple of years and, in an ideal world, cover more than just manufacturer faults. The pricier the product, the more likely the warranty will be solid as it shows that they have confidence in the quality of their product. They may not be as exciting as night vision monoculars but the accessories included can be very useful! In most cases, you’ll find at least a few accessories with your product. These may include a carry bag, lens cloth and even cables to connect it to your computer or television set. Such things are not usually high quality so you may wish to upgrade some of these with time. Tripods are very rarely included with night vision monoculars. Buying night vision monoculars takes a little bit of time and research. After all, there are plenty of features to consider including optical quality, magnification and battery life. The good news is that the technology is improving all the time. And while better products continue to hit the market, prices are becoming more and more competitive. If you’re seriously considering night vision monoculars then our advice is to go for it! We hope that our reviews of night vision monoculars and buying guide help you in reaching a decision. Whether you’re on night-time hikes, hunts or simply gazing at the stars from your garden, we hope you have fun with your new purchase! Note: we’ve also written a guide on regular monoculars that you can find here.